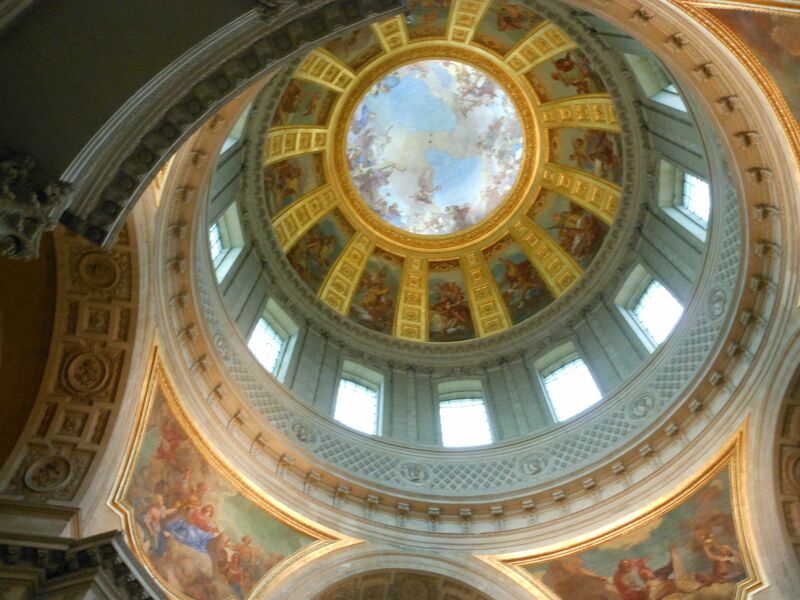 When we first got to Paris, we took a hop-on-hop-off tour of the Seine, and we passed this massive palatial building strangely called L’Hôtel National des Invalides. We were very confused. What kind of hotel has armed guards with machine guns patrolling its exterior? And who names a hotel after sick people? And why does it look like a palace? So many questions, but we were jet lagged and Eiffel tower bound, so we forgot about Les Invalides. (You can read all the answers by clicking the Wiki link on the name). 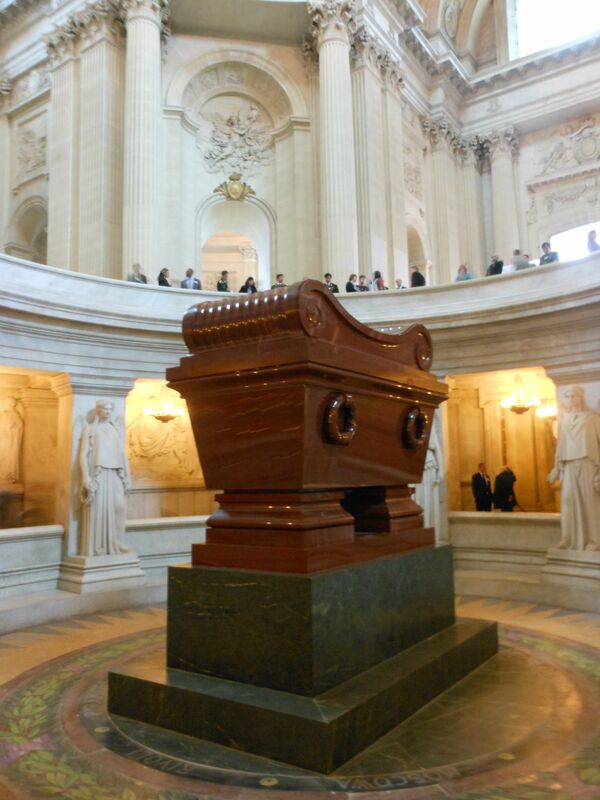 Then on Tuesday night Ed informed me we had invitations to a private reception at the confusing “hotel” we saw known as Les Invalides, which is actually the site of Napoleon’s tomb as well as three different museums. 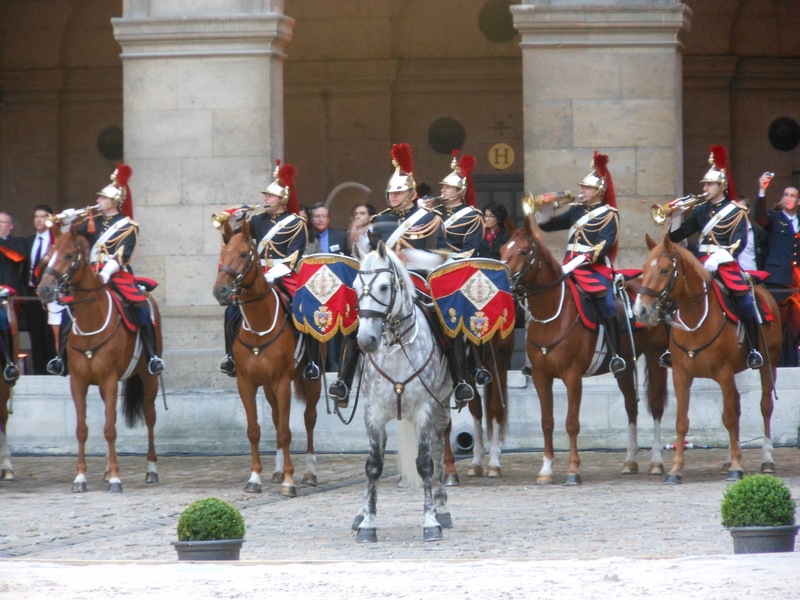 But the real selling point (aside from awesome food and wine) was “fanfare” by the regiment de cavalerie de la garde republicaine, otherwise known as French military officers riding giant horses while playing trumpets, trombones, drums and prancing in elaborately choreographed circles. It was jaw-droppingly spectacular, and I will never forget my front row view. It felt like such a brazenly Napoleonic display of French superiority and made me proud to be a wannabe-Frenchman! Despite my secret suspicion that I hail from French royalty, I finally got over myself and braved the Metro. It was actually quite easy and user-friendly, even with its massive maze of colors and numbers and connecting commuter trains and various you-can’t-get-there-from-here type scenarios. Okay, I will admit my iPhone’s Metro app helped me tremendously, but more due to the tiny map print’s assault on my aging eyes than the actual directional challenges. After all, I am a veteran of the Philadelphia public transportation system, and the Metro/RER is the Ritz compared to Philly’s SEPTA. That said, urine smells the same in every country, and it’s still not my favorite method of transportation. Alas, champagne taste, beer budget. I learned each Metro stop has its own “charm,” and some are more charming than others. 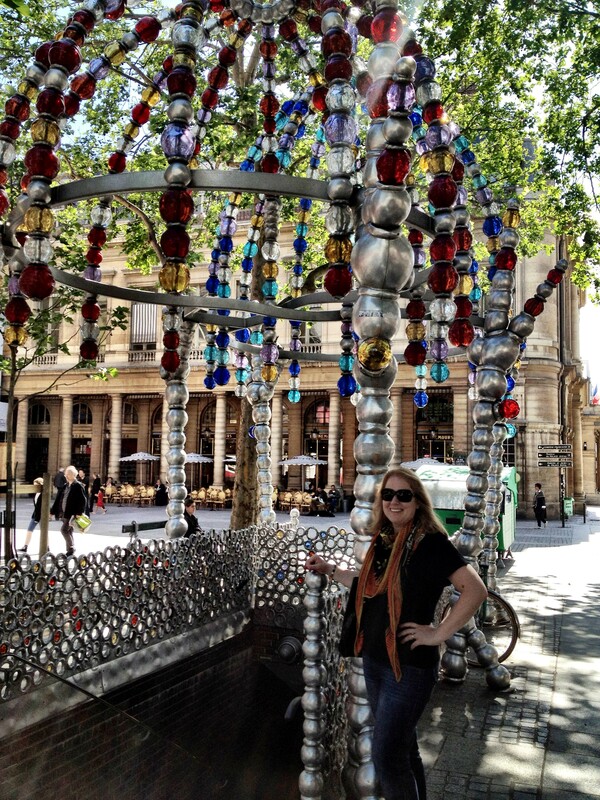 I think Palais Royal, the blingiest Metro entrance ever, is my favorite. It made me happy every time I saw it. (I should note the black background of my scarf is making me look “fluffier” than I actually am, but I couldn’t resist sharing this picture). At least four people have told me to skip the Louvre and head to the Musée d’Orsay, and now I understand why! What a fabulous little museum with a very impressive collection. The layout is so smart and logical, and I was lucky to catch a special exhibit of Degas’ nudes. After my morning of conquering the Metro, next big adventure was sitting down in a very French, not very touristy cafe and ordering a lovely lunch, only to discover that my American magnetic strip credit cards were not accepted for the 23 euro bill, and I only had 9 euros on me. Quelle horreur! I don’t even know how to say, “May I wash the dishes?” in French. Fortunately, I was permitted to run to the nearest ATM (I left my Kindle there as a goodwill gesture, though nobody required me to do so), and I came back with plenty of cash. I would be horrified enough if that happened in the US, but Paris? Ack! Fortunately, the Parisians have been nothing but lovely to me — everyone from taxi drivers to Metro clerks to waiters to Ed’s French business associates. I have nothing but compliments for them, and I’m a bit puzzled as to why they seem to get such a tough rap in the tour guides as rude and unfriendly. Au contraire! I feel like I understand their demeanor quite well, as I am quiet and reserved towards strangers (sometimes incorrectly confused for snobbery or elitism) but I will gladly help anyone who is polite and asks for my help. By the end of my trip, five different people asked me for directions en francais; certainly the most flattering compliment ever was to be mistaken for a Parisian who knows her way around town. My French is not great at all, but I do try, and perhaps that is the difference among people who are finding them rude. I must tend to my enfants now, but I promise there is much more to share later this week. This entry was posted in Life and tagged Les Invalides, Musee d'Orsay, Palais Royal Metro, Paris Metro, Paris travel by Mom Mom's Apron. Bookmark the permalink.